Okra is just wonderful. High fiber food with vitamins A, C, K , B2, calcium, magnesium, phosphorus, protein, low calories… what more to ask? I’ hope this dish will put you into the right mood for a diet! I’m starting the healthiest diet ever to shed a few pounds and clean my body for summer and I will post it all starting today. Stay tuned, join and enjoy. How to make: In a big, heavy pan, heat the olive oil, saute the onions for about 5 minutes, saute the garlic for about 1 minute. Add the okra, diced tomatoes, tomato sauce, soy sauce, salt, pepper. Mix gently. The okra is still frozen so it will be ok. Add some water if needed, not too much, you don’t want to have the okra completely covered with liquid. Cover the pan, lower the heat and cook for 45 minutes. You can dill or parsley. My kids prefer it without. Notes and tips: When you use frozen okra, you don’t need to salt the okra, add vinegar and let it stay like that for a while. I always cook okra like I described and it never gets mushy. You can see it in the photo, taken when the food was done. 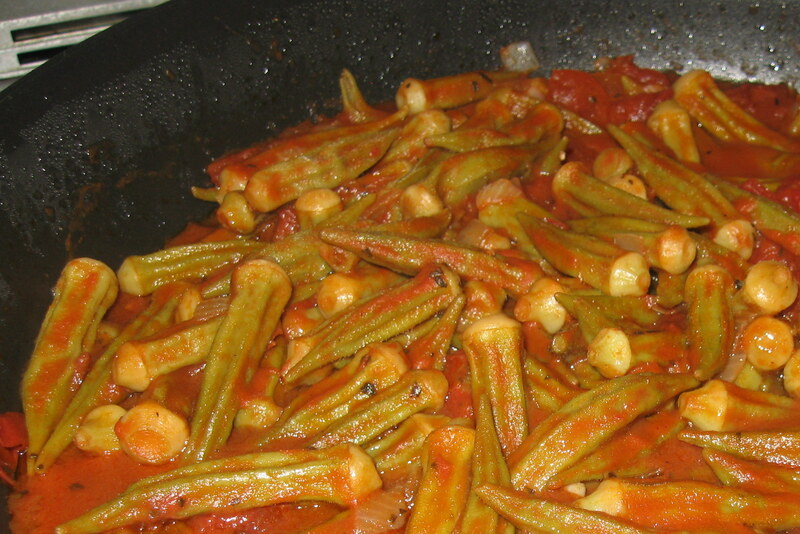 I LOVED the okra stew!!!!!!!!!!! !